On this page you will find links to websites exposing original historical card decks, mainly Tarot related, but also some other. Click on the deck image to get access to high resolution photos of the original cards. More decks will follow soon. Probably the most famous hand painted Tarot deck. Created probably in 1454 in Milan at the occasion of the peace of Lodi. 72 cards survive, but they are scattered over three différèrent collection. 35 of these cards are conserved in the Morgan Library in New York. High resolution images can be accessed if you click on the Conjurer. The Accademia Carrara in Bergamo (Italy) has 26 cards. Only the Emperor is available in High Resolution. The last 13 cards are in a private collection of the Colleone family, also in Bergamo. 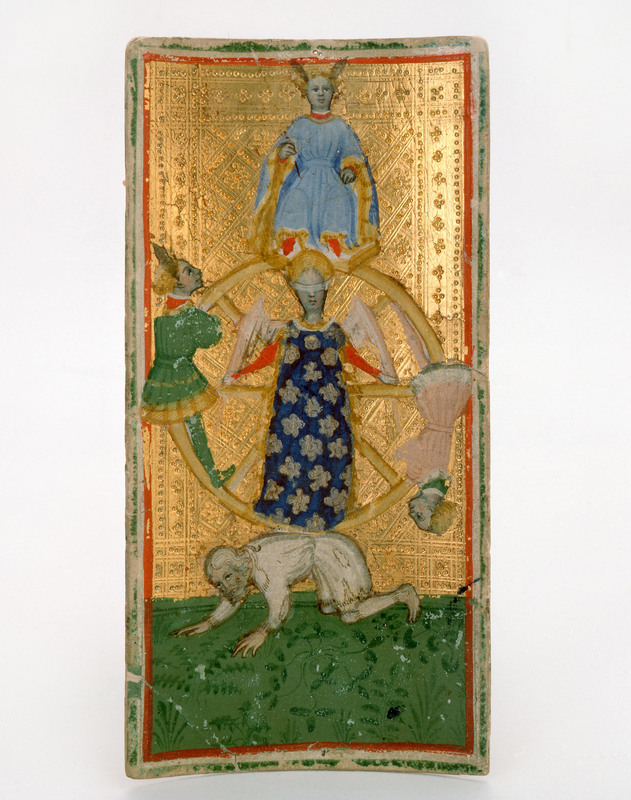 An Italian handpainted Trionfi deck, commissionned in 1473 by Ercole I d'Este, Duke of Ferrara, on the occassion of his marriage with Eleanore d'Aragona. The 16 surviving cards, 8 trump cards and 8 court cards are conserved in the Beinecke Rare Book & Manuscript Library. An Italian handpainted Trionfi deck probably commissionned by the Este Court in Ferrara from an artist from Florence. The French National Library, where the cards are conserved, dates the deck to 1475. 17 cards are surviving, of which 16 trump cards. Probably the oldest deck that had originally 22 trumps. According Ross Sinclair Caldwell the deck is older, somewhere in between 1450 and 1460. Personally I estimate the date of creation between 1460 and 1470. A a-typical deck of 50 cards, trumps only. The overall construction is very similar to the Tarot and many cards appears in both sequences. The shown cards are conserved in the British Museum and dated to 1465 (E-series) and 1470 (S-series)..
Not a Tarot deck but a beautiful and complete example of medieval (1475) European playing cards. These cards that originate from Belgium are conserved in the Metropolitan Museum in New York. Printed Tarocchino deck from Bologna. The original deck had 62 cards, in the Tarocchino di Bologna the 2, 3, 4 and 5 are not used. 57 cards are surviving. Conserved in the French National Library and dated to the first half of the seventeenth Century. The oldest complete (78 cards) French deck, with numbers (Marseille order) and names. Created by an anonymus card maker in Paris. Conserved in the French National Library and dated to the early 17th Century. Complete deck of a pre-Marseille Tarot created in Paris. Dated by the French National Library to around 1650. Oldest known Tarot deck of the Marseille type. Created by Jean Noblet in Paris and dated by the French National Library to around 1659. 4 pip cards are lost. Tarocchini deck created by Giuseppe Maria Mitelli in Bologna. Dated by the French National Library to around 1660. Like the Tarocchino di Bologna, this deck consists of 62 cards. Tarot of Marseille type I deck made in Lyo. Two decks are surviving, one conserved in the French National Library and the other in the British Museum in London. Dated by the Britisch Museum to the early 18th Century, other sources date the deck to 1701 just after the French King Louis XIV started to tax the card making industry. To avoid these taxes, the deck has been made as deck for export only. Probably the deck has been created by Jean Payen using the pseudonym Jean Dodal. Another Tarot of Marseille Type I deck made in Lyon around 1713 by Jean-Pierre Payen. The deck is conserved in the Beinecke Rare Book & Manuscript Library. Following the link, enter 2466 in the RECORD ID box and submit the search. When entering 2465, a similar deck will show up made by Jean Payen in Avignon. Incomplete Minchiate deck printed on silk and dated to 1712. A complete Minchiate deck has 97 cards. The cards are conserved in the French National Library. A Tarochinno di Bologna deck published in the mid 18th Century by Antonio de Maria. It is one of the first Tarocchino decks that has the four Mori instead of the Emperor, the Empress and the two Popes. The deck has 62 cards and is conserved in the British Museum. A Tarot of Marseille Type II deck created in 1760 in Marseille by Nicolas Conver. The best known Marseille deck. This particular deck is conserved in the French National Library. A Belgium Tarot, derived from the Tarot of Jaqves Vievil, created in Brussels around 1780 by François-Jean Vandenborre. The deck is conserved in the British Museum in London.